Cosmetic surgery is a distinctive subspecialty that uniquely restricts itself to the enhancement of appearance through surgical and nonsurgical aesthetic techniques. It is specifically concerned with maintaining normal appearance, restoring it, or enhancing it. Cosmetic surgery is a multi-disciplinary approach directed to all areas of the face, neck, breast, and body. The educational profile of this surgical subspecialty is unique in that first begins with a fully trained surgeon. Cosmetic surgery as a subspecialty incorporates surgical knowledge from many contributing disciplines to attain a high level of skill and surgical knowledge. These contributing disciplines include dermatologic surgery, otolaryngology facial plastic surgery, general surgery, plastic/reconstructive surgery, oculoplastic surgery, oral-maxillofacial surgery and others. We realize that patient safety while undergoing surgery is of utmost importance. Therefore, all cosmetic surgery procedures requiring general anesthesia are performed at Baylor Surgicare at Mansfield, a JCAHO (Joint Commission) accredited and AAAHC certified out-patient surgical center, located a few miles from our office. Furthermore, all surgeries will be monitored by board-certified anesthesiologists and anesthesia providers. In addition, Dr. Thornton has full cosmetic plastic surgery privileges at Medical Center of Arlington to better serve his Arlington clients or in the event your procedure may require an over-night hospital stay. However, minor cosmetic surgery procedures requiring local anesthesia may be performed in our own private procedure room. The American Academy of Cosmetic Surgery is a professional surgical society whose members are dedicated to education and patient safety in cosmetic surgery and the American Academy of Cosmetic Surgery is the accrediting organization for the current 17 Fellowship programs in cosmetic surgery. Founded in 1985, there are now over 2000 members. Dr. Thornton completed a 12-month AACS-accredited surgical fellowship in cosmetic surgery and is a Fellow in the American Academy of Cosmetic Surgery (FAACS). What does it mean if a surgeon is “Board Certified”? Being a “Board Certified” or “Diplomate” surgeon means that he or she has successfully completed an approved surgical residency training program and successfully passed a rigorous written and oral evaluation process designed to assess crucial knowledge, skills and experience necessary to provide quality patient care in a particular surgical specialty or subspecialty. In the case of Cosmetic Surgery, the American Board of Cosmetic Surgery (ABCS) is the only American board that certifies surgeons exclusively in the field of Cosmetic Surgery. 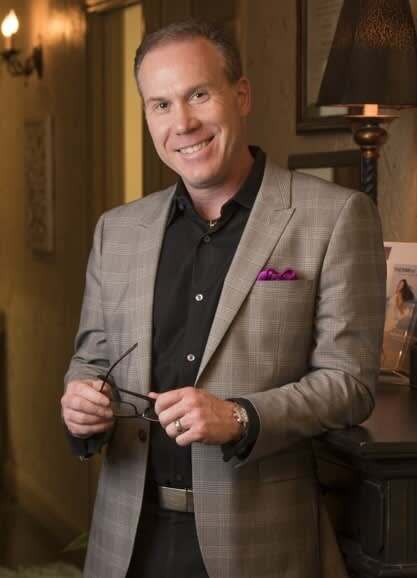 Dr. Michael Thornton is a board certified Diplomate in three separate surgical specialty areas: 1) American Board of Cosmetic Surgery – Cosmetic Surgery 2) American Osteopathic Board of Surgery – General Surgery 3) American Osteopathic Board of Surgery – Critical Care Surgery / Trauma. It is advisable to seek a surgeon who is a Board Certified Diplomate in their respective surgical specialty or surgical sub-specialty. 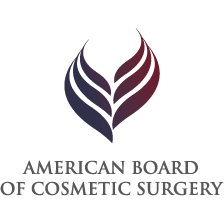 The American Board of Cosmetic Surgery is the only written and oral certifying board specifically devoted to examining a surgeon’s skill exclusively in cosmetic surgery of the face, breast, body, cosmetic dermatology, cosmetic surgical principles, and patient safety. It is an independent sub-specialty board that examines and certifies qualified surgeons who are already board certified from various disciplines including facial plastic surgery, general surgery, plastic surgery, otolaryngology, oculoplastic surgery, and oral-maxillofacial surgery. Dr. Michael Thornton is a double board certified Cosmetic Surgeon and Diplomate of the American Board of Cosmetic Surgery (ABCS). He serves on the Board of Trustees of the ABCS and also serves as an oral board examiner for the ABCS whereby he actively participates in the oral examination process for future Diplomate candidates. 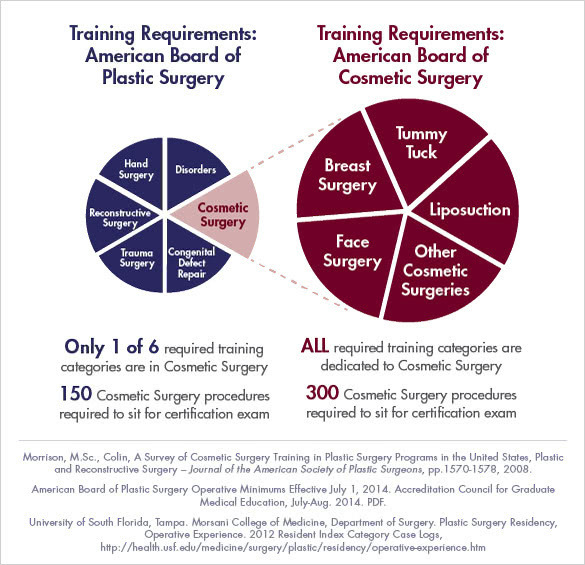 What type of training is required to be Board Certified in Cosmetic Surgery? Complete an ACGME or AOA Residency in a related specialty and become board certified in that specialty. Complete a one-year, AACS-approved fellowship in cosmetic surgery. Programs must be approved and affiliated with the American Academy of Cosmetic Surgery (AACS). Surgeon must perform at least 300 individual cosmetic surgery cases: 50 procedures in body or extremity surgery, 50 procedures in cosmetic breast surgery, 50 procedures in dermatologic surgery, 50 procedures in facial cosmetic surgery. Remaining 100 procedures can be any combination. Only after successfully completing this sequence of training and experience, as well as meeting a number of other requirements, a surgeon may apply to become a diplomate of the American Board of Cosmetic Surgery. The American Board of Cosmetic Surgery (ABCS) prides itself on setting the highest standards for surgeons in the specialty of cosmetic surgery. 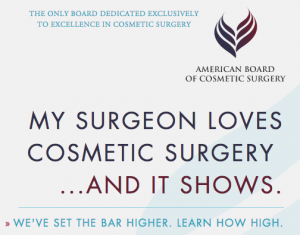 Click on the link to read through 9 Facts About ABCS Surgeons and what it takes for a surgeon to become board certified by the American Board of Cosmetic Surgery and you will see why choosing an ABCS surgeon means you are choosing a genuine cosmetic surgery specialist.